Vacation rental house. Sleeps 7, 4 bedrooms, 2 bathrooms. No pets allowed. The property here is incredible. Incredible views, the sauna is a treat, it's cozy, the wrap around deck is awesome, etc. That said, I've stayed here twice now and the pots and pans give me the heebey jeebeies. I actually brought my own this time which made cooking a much more enjoyable experience. Overall the house has become well loved in the year since I had visited before. Lots of little things were broken, paint is chipped in places, etc. It's ready for a face lift and deserves it since it is such a great property. Thank you for your review! We appreciate the feedback. This is a wonderful house and we will definitely take a look at these details for fixing. We hope you can come back again. Celebrating 2 birthdays with girlfriends, there were 5 of us and we all had a comfortable stay. Kitchen is well appointed, beds were cozy and the fireplace was great. Thank you for your comments. We are so happy you found an "amazing' home to stay in on Whidbey Island. We hope to help you with your next stay on the Island. My family and I had such a great time vacationing in this beautiful home, we were afraid we wouldn’t be able to do a week without WiFi but turns out, we made it! The house is just amazingly beautiful! As careful as we thought we were being as we packed up, we still missed a few items that the manager has graciously offered to ship back to us. So thankful for the whole experience! Thank you for your comments. We are so happy you had such a "great" time on Whidbey Island. We"ll get those items back to you and hope we can help you with your next stay on the Island. The place was amazing and the staff at Tara Property Management were wonderful in making it happen. The Picture of the house is nice but the view from the house toward the water is exceptional. Wrap around deck was fun as my two year old grandchild and I raced around it, back and forth.Four year old and grandma walked the property looking for slugs and found some really big ones. We would definitely love to return to the property in the future. Thanks Tara Property management for the Pack and Play and Iron delivery. Thank you for your comments. 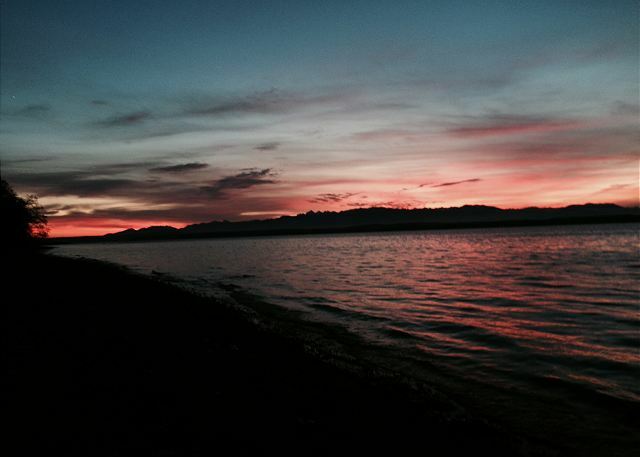 We are so happy you found your stay on Whidbey Island "amazing". We will be glad to help you with your next stay on the Island. This place is Beautiful. You get the woods and the beach all at the same time. And that view.... Loved the place! Thank you for your comments We are happy you had a great stay, hope to help you with future stays on the Island. Very enjoyable stay for 7 mature women in this well appointed house. I realize it is the busy summer season, but some areas of the house could really use a deeper cleaning. Kitchen was well stocked and beds and furniture very comfortable. We would love to come stay again sometime. Thank you for your comments. We are happy you had a "very enjoyable stay" on Whidbey Island. Please let us help you with your next stay on the Island. Very nice, comfortable house with great views of the sound. Quiet. Family and I had a great time here. Easy access to ferries, hikes, etc. Thank you for your comments. We are so happy you had "a great time" on the Whidbey Island . Please let us help you with your next vacation on the Island. We loved this place, it is a beautiful property in an excellent location. Out favorite part was the views offered of the sound and the wild life that lives near by. There is a Bald Eagle Nest in a tree that is part of the view, the eagle would spend a good part of most mornings sitting in or near the nest, my wife liked to refer to it as “her morning coffee buddy”. There were also a plethora of dear, rabbits, seals and a few owls that liked to visit. While the outdoor portions of the home do show some signs of aging it should be expected on a exposed ocean front property, and to be honest it really adds to the overall rustic feel of the home. I really can’t emphasize how much we loved staying here, with that said there are two minor notes perspective renters should now. First the septic system is really too small, it was slightly inconvenient trying to time showers, baths (there is a jetted tub, not a hot tub like the posting on VRBO suggests) dishes and laundry in a way that didn’t overburden the system, even with our efforts we did still manage to set off the septic alarm once. Also, while the views from the house are spectacular the lack of curtains and the existence of wall size windows makes it difficult to sleep late. Other than those very minor issues our stay was truely magical. Thank you for your comments> We are happy you "loved" staying with us on Whidbey Island. We hope we can help with your next stay on the Island. Staying at this house was a delight! It is beautiful, well equipped, clean, and incredibly relaxing!! We will definitely come back. Thank you for your comments. We are glad you had a "delightful" stay on Whidbey Island, it is a "relaxing" place. We hope to help you with your next stay on the Island. The place was exactly as described on the website. It was a beautiful place and very relaxing. I loved the owners taste in furnishings and art on the walls. Of coarse the weather was perfect too. The access to the beach was a good work out. I hope to come back again next year. Thank you so much for your review. We are happy to hear you loved the vacation home you stayed in. We hope to see you again. As we were eating breakfast. 4 deer wandered by and that was just the beginning. The sauna room was perfect after a long day of mountain biking. We all enjoyed playing cards after dinner then watching a classic movie on the DVD. An amazing weekend in a cute comfortable cottage with the best views. The sunsets were beyond beautiful. Wow....thanks for your review. Sounds like you had a great time and were able to have an enjoyable weekend. Three friends and I were able to take a much-needed break and relax here for a weekend. The house is a great spot if you need to get away and unplug. The only thing that I would change is the fact that the only window coverings in the entire house are in the two bathrooms. I do like letting the light in during daytime, but at night it felt a little odd. We also weren't aware until after arrival that the beach was inaccessible from the property. And finally, the listing says there is a hot tub, but it is referring to the sauna. Other than those minor items, we thought it was great! Our stay was very nice overall. Thank you for your review! We're glad you were able to get away with friends for a relaxing weekend. This home and setting provided the most magical experience! In addition to the perfectly designed use of space and all the amenities provided for practical needs, the home and environment are the stuff of pictures that you see and dream about but don't think could ever be real! I can't gush enough; the stay at this home was charmed! Thank you for your comments. We are happy your stay was "the most magical experience" and our space met all of your wants and needs. Please let us help you with your next stay on Whidbey Island. Lovely home with lots of space and a cozy great room with a grand rock fireplace. Lots of space with 4 large bedrooms and a well equipped kitchen for a great relaxing vacation. The folks at Tara Management communicated amazingly well and were a pleasure to deal with. We are very pleased you enjoyed your stay at our Westside Waterfront View home and that you found it to be cozy and welcoming. We appreciate your business and look forward to having you stay at a Tara Vacation Rentals home again soon. overall a wonderfully peaceful stay. Great views of water and variety of ships and boats cruising through. Bedrooms- lovely, beds very comfortable but pillows provided were cheap and lumpy. we had planned on watching the dvd’s we alll brought, but the DVD player would not load. We tried to load other dvd’s thinking one may have been damaged but it appears that it was the unit. My second disappointment were the couches. They don’t offer much in the way if support. If you have any back issues I recommend using the rocking chairs and perhaps bring some lumbar support. Thank you for your feedback and we are very happy to hear you had a nice stay! However we are sorry about the DVD player and the couches. We will look into the DVD player right away! I wish we would have known as we could have brought you a temporary DVD player for your stay. We always try to help fix any guest problems right away as much as possible! We will also pass on the feedback about the couches to the owner of the home. Thank you again and we hope you can return to stay with us in the future! This house was great all around. Very clean and nice, great location near the water and easily accessible from the ferry. Quiet and spacious - highly recommended. Thank you for your comments. We are so happy you had a "great" time and "highly recommend" this home. Please let us know if we can help you with your next vacation on Whidbey Island. My husband and I shared this lovely rental with our children and grandchildren and we had a wonderful time. The house is spacious and the views are beautiful. We loved having fires outside at night, and relaxing on the wrap around porch. Only problem, there is no internet, and the alarm system for the septic went off twice while we were there and the button to silence the alarm did not work. Those items should be addressed, but overall we enjoyed our stay. Thank you for your comments on your stay on Whidbey Island. We have addressed the button for the alarm, hopefully our actions have alleviated the alarm button. Thank you once again and hope we can help you with your next stay on Whidbey Island. We had a great time at the house. The trail to the beach was steeper than we initially thought it would be based on the reviews. Also, the previous renter had made it impossible to lower the stairs. When I called Tara Properties they were really responsive and got back to me right away. The house was clean and well stocked for our purposes. Grill took a bit of finesse to get lit but worked well once we got it going. Thank you for your review and feedback. We have addressed the winch for the stairs down to the beach and it now is working as it is supposed to! Thank you for bringing this to our attention. We look forward in helping with your next trip to Whidbey Island. This was a wonderful place for our getaway weekend! Very beautiful, clean, relaxing, and a great beach to hike down to. We were all very happy with our time. We are so glad you had an enjoyable weekend! We hope you'll stay with us again. Thanks for your review! Windows need to be washed and some minor cobwebs need to be cleaned, but this is a great place to stay. Cleanliness is a top priority of ours so we will take care of this quickly. Thank you for your review and we're glad you had a great time. We were 6 girlfriends, retired teachers, from Skagit County. The house was cozy and comfortable. Loved the views to the west. WOW!! What a fun trip. Glad to hear you loved this home. Whidbey Island has some of the best views ever! Thanks for your review. Simple objective, to have a cozy, reflective and fun weekend with my adult children who all reside in Washington State. This was an excellent place for us. The kitchen, dinning and living room was perfect playing board games, nice fire (bring firewood),watching DVDs. Kitchen well equipped with food prep and service. Used the sauna one time, nice! Walked down to the beach, pretty steep but manageable. Stairs well maintained and equipment for lowering the stairs cleverly designed. We were all pleased and will treasure our time at this home. Thank you so much for your review. Nice to hear you had a fun family weekend. Thank you for your review. This home doesn't have any WiFi. For future guests-in all our rental homes, the amenities are listed for each home. This was a very nice home on a large lot. If your looking for a quiet retreat this is the place. There was a surround sound stereo and a DVD player no TV available which allowed us to catch up on our reading and enjoy the beautiful landscape. Thank you for your review. We're glad you liked your vacation rental and were able to relax. Good experience. The house worked perfectly for our needs with plenty of places to settle in with a book, and great bedrooms. Kitchen worked great for our crowd of seven women and had pretty much everything we needed (and we are all serious cooks). One issue is that while the description says jetted tub, the easier to read list describing the property says hot tub, which is misleading. Sauna is nice though. Walk down to the beach is steep, but manageable. Beach is wonderful and quiet. We saw no one else on the beach the whole time. Thank you for your review. Glad to here you had a great relaxing time with your book club and that the home worked out great for your needs. Wonderful Week's Stay on Whidbey Island! This home and property definitely exceeded our expectations. Spacious and spotless, we felt at home immediately. The beds were all very comfortable, there were plenty of towels, and the layout was perfect for our family of 7 with grown children and significant others. The view from the back yard is spectacular, and the fire pit was a big hit. The trail to the beach is indeed long and steep, but it is very inviting, and it seems that this property is one of very few with beach access, so it is worth the journey. This property is very well situated for a variety of activities and restaurants, including Langley's Useless Bay Coffee, Whidbey Island Kayaking Company, and Sundance Bakery, Greenbank Grill, and the Coupeville Ferry Terminal. The kitchen is better stocked than I expected. Not only do I highly recommend this property, I hope to rent it again! Thank you so much for all of your comments. We're so glad you had such a great experience. We appreciate your review! The porch & the view: we drank coffee on the porch in the mornings and watched the boats on the water, the bunnies in the yard, and, best of all, two bald eagles resting in a tree right in front of us! Beautiful. The house: Everything we needed was there (although some of the kitchen supplies/pots/bowls were spread around the drawers/cabinets and pantry.) The only supplies call out: there were only ~6 mugs. With only 3 adults we were fine but in a 4 bedroom house others might be hand washing mugs if they are morning coffee/evening tea drinkers like we are. Also, a previous review mentioned there were not enough towels - this is no longer true, there were 10+ by my count. Only caveat (which I think others have mentioned) - the back yard is extremely uneven and the trail to the stairs/water is pretty steep. Renters with small children should be cautious. 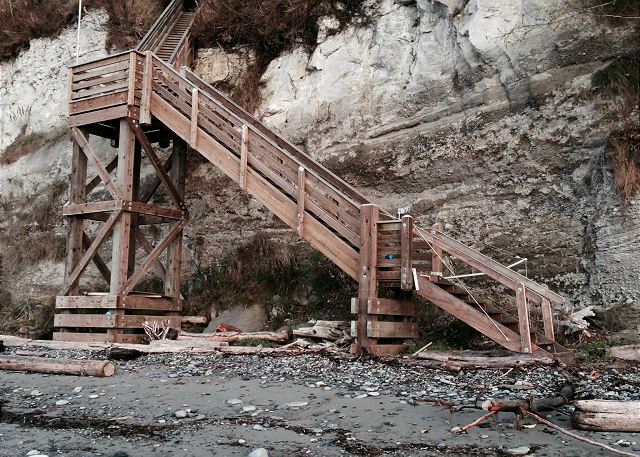 Also, the beach stairs were still unable to be fully lowered during our stay due to cliff erosion in Winter 2015-16. However, we were able to easily climb down from the lowest available point (at least when the tide was out) and enjoy a great morning walk for almost a mile along the waterfront! Overall we had such a great stay and can't wait to return for more than just a weekend! Thank you for all of your comments and for your review! We're glad you enjoyed your stay. What an absolutely amazing place to get away and relax! From the first step onto the wrap around porch we were wowed. The house was well appointed, clean, and so tastefully decorated. The beds were comfortable and there were plenty of linens. My only desire was for pillows with a bit more loft. We enjoyed croquet on the lawn, an evening fire in the fire pit, and a morning walk on the beach. Having a sauna was a luxury and a great way to end each day. The weather was gorgeous while we were there and the views were unforgettable! Most nights we ate at the house, but did venture out one night and headed into town to eat at Gordon's on Blueberry Hill. Not to be missed and fairly close to the house is Green bank Farm and the Whidbey Pie Company. Unplugged from the grid and plugged into family. We will definitely be back! Thank you for your suggestion and for your comments. We're glad you had a good time! Thank you for your review! We are from Seattle and we like to get out of town during the winter months. This beautiful home was the perfect place to do papercrafts and games with a couple of middle school best friends. We (the Moms) had a great time too. So glad you enjoyed your stay. Thanks for your review! We had a lovely time at the house for a weekend retreat. The property and house are beautiful, very well taken care of. Thank you for thoughtfully setting up this house and for the sauna!! We are so glad that you had a good time. Thank you for your review! We rented Westside Waterfront View home with great expectations of where it was on the island and what we would see there. We were right to think that; it was breathtaking and awe inspiring there. In our party we had a photographer, a writer, artist, general contractor, etc. and we were all greatly pleased with the home and property on so many levels. We would all highly recommend this beautiful piece of heaven! So glad you enjoyed your stay! Thank you for your review. We entered this domicile as boys and we left as men. A small landslide had destroyed the stairs to the beach, but that didn't stop us from getting down there and seeing what we could see. And we saw a lot. We're glad you were able to conquer that obstacle. The stairs have since been fixed. Thank you for your review! great experience and property management group was wonderful in making accommodations due to power outage from large storm. Beautiful home and property. Wonderful views of water and mountains. We had a mini family reunion with my sisters and niece in this delightful house. It was such a pleasant place to hang out, cook, and pamper ourselves with the delightful view. The house is well kept and supplied with cooking equipment. Everything was clean. We loved this spot. Parking was okay for one car, but would be challenging for multi cars. It does not have wi-fi and the tv is small, but that didn't matter to us - and it was a good way to disconnect for a few days. There is a generator which reassured us since a wind storm was rolling in. (We never lost power.) My niece was disappointed that we hadn't seen deer because there was evidence of deer. As we were leaving four deer were by the driveway and we had a very clear view of them. This house met all of our hopes and expectations. We stayed for a weekend with the family for grandma's 60th birthday. The views are fantastic, the front and back yards were great for the kids to play, and the wrap-around porch was perfect for the rainier days when we still needed to get outside. The only reason I'd give it 4 stars instead of 5 is for upkeep. The dishwasher didn't do a great job of cleaning, and the dishes weren't super clean. Lots of crumbs in the drawers, etc. Didn't detract much though - we would consider renting again in the future! Thank you for your review and feedback! We will check do an inspection on the kitchen cleanliness right away! We enjoyed everything about this house and wish we had been able to stay longer. It's very spacious inside, and has amazing views of the water. Direct beach access, and a yard for enjoying the outdoors. I have nothing bad to say about the place or the management company; we had an all around positive experience. Our family of 8 adults (including family from AZ) and 2 toddlers stayed at the Westside Waterfront house for a nearby family wedding. Perfect! The view, the house, the grounds all exceeded our expectations. It was lovely! Deer shared our yard regularly. We shopped for groceries in Freeland, and ended our too-breif weekend with a great breakfast in Langley. We will definitely return when we can enjoy more of the island. When we come back, we will bring our own towels and more pillows. Otherwise, the house had everything we needed for making lifelong memories! We had 2 families stay at the house for a long weekend. The house and amenities were very nice and family-friendly. The property is gorgeous, with amazing sunset views and beach access. We would definitely stay there again if we have the opportunity. We rented this home for a week to get away from the city with our family. Overall, it met our expectations. The property is private and conveniently located mid-island. The setting overlooks Puget Sound with views of both ends of the Port Townsend-Coupeville ferry, the Olympic mountains and lots of boat traffic. The hike (yes, its a hike) to and from the beach was strenuous, but the rocky beach was quite nice. We would have appreciated a few more kitchen tools/pots, but aside from that everything was good. We enjoyed the croquet set. The house and the grounds were absolutely beautiful. We woke every morning to the sites of the Puget Sound. Deer, chipmunks, eagles and long walks on the beach all made our time on Whidbey Island so special. My husband and I rented this house for a very rare, and probably last, vacation with our almost-grown three children and our son's finance. I had looked for months for a very special place to stay, and this seemed to fit the bill. The pictures looked nice, but sometimes pictures look nicer than reality. When we pulled into the driveway for the first time and saw the house and Puget Sound beyond, we knew already that we were going to be sad when the time came to leave! The house is MORE beautiful than the photos, clean, well-designed and comfortably furnished. The yard is amazing. Looked out the windows to see deer crossing through the property every day, as well as eagles and other wildlife. The wrap-around porch is very spacious, and a perfect place to enjoy a cup of coffee, watch ships pass by, and enjoy the gorgeous view. We also loved the beach! Including the path down to the beach, which looks a little intimidating at first sight (and is very steep) but we grew to absolutely love it. And, of course, the beauty and serenity of the quite private beach itself. We saw no one else on the beach during our entire stay. Sure enough, the time to leave came much too soon, and we were terribly sad to leave this idyllic place. Would highly recommend, and hope that we can return someday! This is a beautiful house and location. It was a bit frustrating in that they want you to wash towels and run the dishwasher before you leave, however they provide no detergent! Everything was lovely! I would recommend this location to anyone wanting to get away. My family enjoyed a relaxing four night retreat in this fine property. Very well maintained and easy to arrange. Thanks! It was wonderful - everyone was asking if it was as wonderful as it was in the photos...and all I could say is "yes". Would love to stay sometime in the summer, but it was great just spending some time with family during the holidays. This is an amazing property that provided a perfect setting for a holiday family retreat. Roomy, inviting, clean and well appointed. The house and grounds are beautiful. With visits from deer in the yard and bald eagles soaring overhead it felt as if we were away from it all, when in fact civilization was a short drive away. Loved that this location is so close to state parks on the island. Overall, we were very pleased and would highly recommend. Hope we can come back before too long. The house is in great shape, very well laid out, nicely furnished. There are a couple of things to know - there is no TV or internet service. This was disappointing over a Thanksgiving visit when the Seahawks were planing Thursday night. The beach is accessible, but it is a stiff climb back up, I would consider this more of a view property than (low|medium|high) bank waterfront. The kitchen is great and very well furnished and laid out very well. Wonderful, wonderful property and place to stay. Only issue was we could not get TV to work, but who needs a TV when you are staying at this house. This is a beautiful peaceful setting with spectacular views. We stayed for a week and thoroughly enjoyed it. The house is full of charm and character within reach of the island's amenities. Bald Eagles, deer, quail and many more birds provide peaceful entertainment as they wander past. It's worth it to make your way down to the beach via the stairs and walk alongside the Sound taking in the views. I would recommend this house to anyone who is looking for a place to get away from the rat race and have a relaxing vacation. Wonderful spot to unite with Family from out of state. Fun spot with something for all ages. Fantastic view and great beach. Don't. Miss the Whidbey pie company at nearby Greenbank farms. This house was almost perfect for us. The location vis-a-vis the water just right. My favorite part of the house is the wrap around deck and the upstairs bedrooms. Such a beautiful place, full of light and peace. We loved our stay here. Thank you so much! We thoroughly enjoyed our stay at this beautiful cozy home overlooking the water. In the evening we trekked the short but steep path down to a very private beach and watched gorgeous colorful sunsets. The house was spotless, the kitchen well stocked with whatever we needed for cooking. The only disappointment we had was that the sauna, which was a major drawing point to renting this house, was not working. Despite this, we have already recommended this property to others! We apologize about the sauna for this guest. The sauna works great, but there was a reset button that just needed pressing. Very sorry about that! This house was perfect for three couples just to kick back and relax. Beautiful location, with a great view of the water where we watched boats and submarines go by. Close to some nice wineries and funky little town. House was very clean, well stocked, and the beds comfortable. The sauna was a nice addition! Definitely recommend for a weekend getaway, or longer. The home was very nice, and we slept really well. The beds are very comfortable. The only downside was the propane hot water tank was turned off so we did not have hot water until the next day. We had to look up the directions online to get it started. Even prettier than the pictures! Gorgeous view, well stocked kitchen, everything just perfect! This house has it all. Beautiful views, comfortable beds, great linens. We really enjoyed our stay and can not wait to return for another visit.